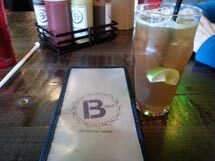 Here I'm enjoying a B Spot burger. Have you ever had cheese burger with fried bologna? Yum, don't hate appreciate lol,old school. Yup you guessed it I washed it down with Wrong Island tea, double tasty.